On 18 June 1964 the first trans Pacific telephone cable was completed. The 5282 nm section from Hawaii to Japan, via Midway, Wake and Guam, was laid by CS Long Lines during the first five months of that year. At Hawaii it linked up with COMPAC and HAW 1. The design and management of the system was a joint project of AT&T, the Hawaiian Telephone Co., and Japan's Kokusai Denshin Denwa (KDDI). The cable was manufactured by Standard Telephone and Cables Ltd., England, Western Electric, USA, and the Ocean Cable Company (formerly Nihon Kaiteidensen Co.) of Japan It used the lightweight cable design developed by the British Post Office in 1951 but not placed in service until CANTAT 1 in 1961. 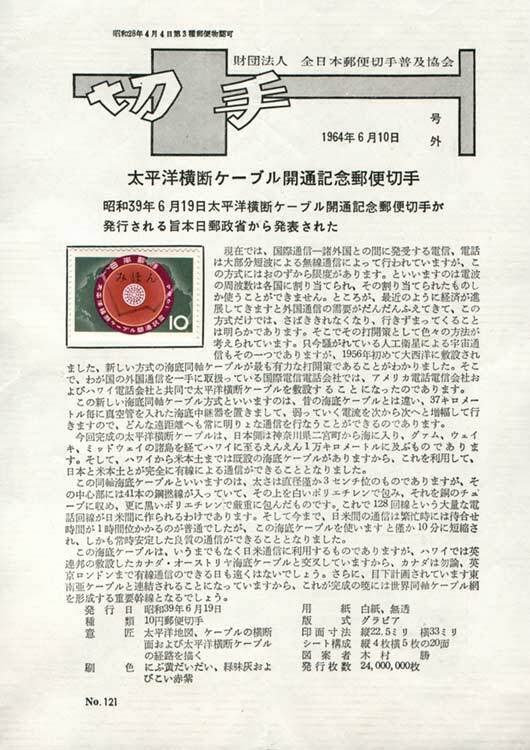 The manufacture of this cable can be seen in the film on CS Long Lines on this page. 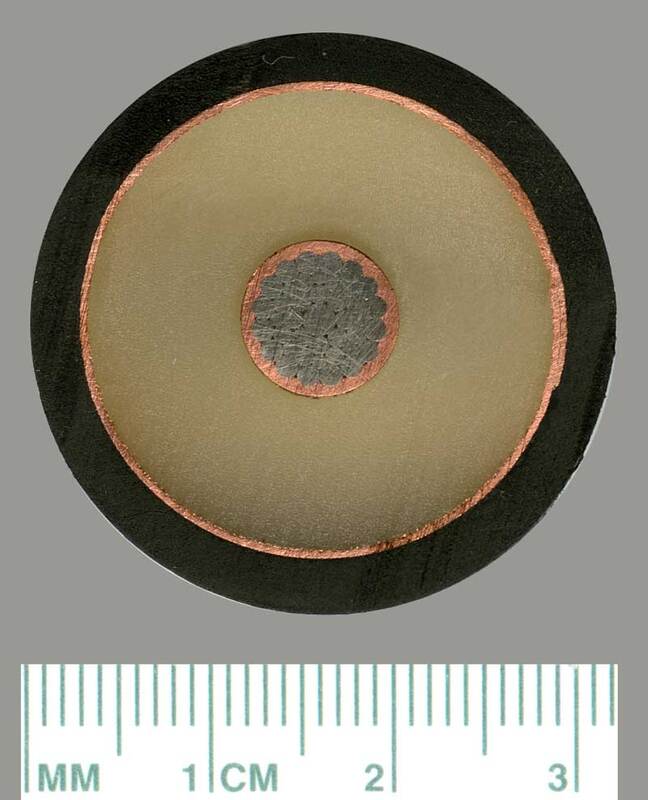 This lightweight cable has a stranded steel core for mechanical strength, surrounded by a copper conductor, polyethylene dielectric, and the coaxial conductor (either copper or aluminum), to a diameter of 0.990" (21.15mm) The outer cable sheath for the deep-sea section is a polyethylene layer instead of the traditional heavy steel armouring wires, with the overall diameter being 1.25" (31.75mm). The 0.990" lightweight cable used for TPC-1 was designated Type SD. Other types of lightweight cable have 1.25" and 1.47" core diameter. Withdrawn from service in 1990, TPC-1 was subsequently used for scientific research on earthquake detection. The first transpacific undersea coaxial telephone cable linking Japan, Hawaii, and the U.S. mainland was completed in 1964. 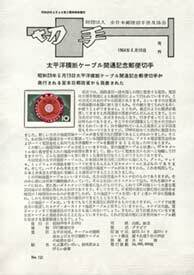 President Lyndon B. Johnson and Prime Minister Hayato Ikeda inaugurated this communications link on 19 June 1964. This joint project involving American Telephone and Telegraph, Hawaiian Telephone Company, and Kokusai Denshin Denwa improved global communication and contributed to deep-water submarine cable technologies. An identical plaque was placed at the offices of Hawaiian Telcom in Honolulu. The IEEE page above has photographs and further details of the Milestone, as well as links to supporting material.